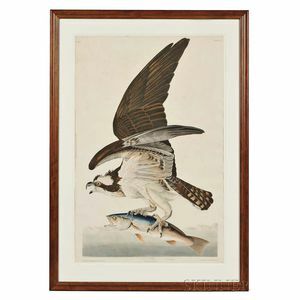 Audubon, John James (1785-1851) Fish Hawk, Plate 81. [from] The Birds of America. London: Havell, 1827-1838. Hand-colored engraving, printed on wove J. Whatman 1830 watermarked paper; variant I, with plate number in Arabic numerals, Audubon's credentials listed as: F.R.S. F.L.S. & C., and titled: Fish Hawk, Male. 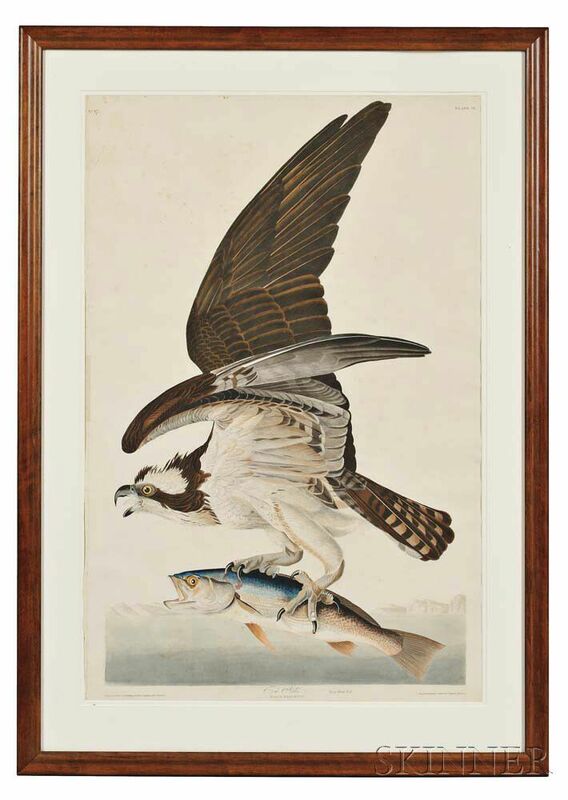 Vulgo Weak Fish / Falco Hallaetus; Havell's address reads: Engraved, Printed & Coloured by R. Havell Junr. 1830. [The plate number in the later variant is in Roman numerals, Audubon's credentials are listed as: F.R.S. F.L.S. ; and the title appears in a bolder cursive hand, reading: Fish Hawk or Osprey, with Falco Hallaetus to the right; Havell's address no longer contains "Junr.," "London," or the 1830 date.] Matted and framed, some spots and fading, the sheet 38 1/4 x 25 1/4 in. Provenance: from the estate of Dr. James Woodward Wallace, Coolidge Hill, Cambridge, MA.